Subham Saurabh, Himachal Pradesh National Law University – Shimla. 11th Jan to 17th February 2018. When I joined my university on the very first day I was told by our professor that Seminars, Conferences, Debates, and Internship are an integral part of Law course. In the first year, I was told to do an internship with an NGO. I searched online and then came to know about Breakthrough NGO which worked for child and women empowerment. Since it was near my home in Lucknow, I applied. I was always interested in working for a social cause. I was willing to go for the same. For applying in Breakthrough NGO, Lucknow one needs to email his/her updated CV with a cover letter at the email provided on their website. I did not get any confirmation email. I had to call their office and talk to them about my internship confirmation. On the first day, I was introduced to the coordinator – Archana Ma’am. She took a small interview. I had to sign a form regarding Child Safeguarding Policy. There was no compulsion to wear college uniform. You can choose how to dress – casually or in formals. People working there are kind-hearted and always ready to help you. The infrastructure of the office is very good; office address is easily available on google maps and easy to find. The office was in a house – it had 4 rooms and a kitchen with Wi-Fi Facilities, etc. I got a separate desk to work on. Well, it was a 6-week internship, which made me feel special being a part of Breakthrough. For the first week, I worked in the office. There is not much work if you have basic knowledge of Microsoft Office and computers. Since I did not have my personal vehicle, I was supposed to work from office since the selected field was far from the city. Breakthrough is a Human Right Organisation which works for Women Empowerment and Child Rights. They have around 100 selected schools and community in 3 blocks of Lucknow – where they teach students with specific modules designed by them. They form various groups in schools, according to age groups, where they deliver the basic knowledge. On 20th Jan I got a chance to do a field visit with a trainer – Shweta Ma’am. It was a government school where the trainer delivered lessons from the module. The children were very happy on seeing us. Then the trainer started teaching the module provided by Breakthrough. The students were very enthusiastic and responsive in class and they actively participated. After the lesson got over, the students were made to play a game ‘Kana-Fussi’ (Chinese Whispers) which was related to the lesson (Suno Toh Sahi Se Suno) taught to them. The same thing was done on that day in another school as well. There was a meeting with women in a village about their empowerment and related issues. Similar things took place when I visited other fields of work too. One of the best things was that the children recognized the trainers and whenever they saw them their excitement increased. 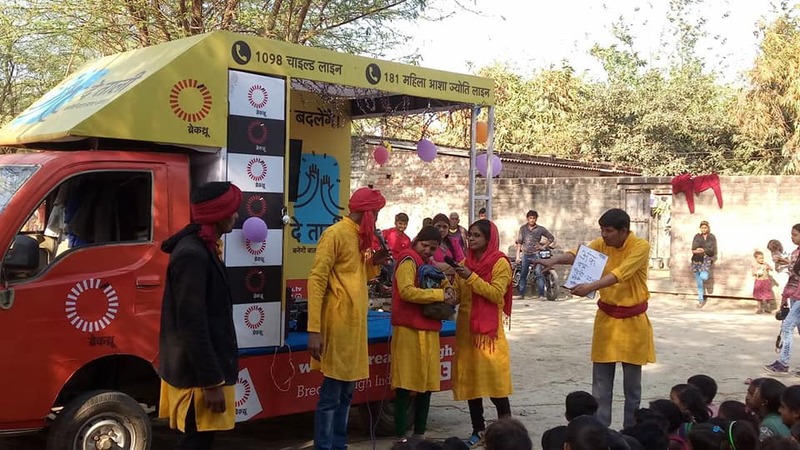 Another project was run by Breakthrough – Video Van Campaign (De Tali) which educated people by a method of displaying short Videos, conducting Drama Sessions (Ham Banayenge Behtar Kal), and Games etc. In one month we covered 10 blocks and performed at 90 different spots. Their main motive was to communicate about educating the girl child, promoting health services and bringing an end to the discrimination between males and females. I witnessed the Video Van runs in three blocks. Meeting people, talking to them and knowing their views was a good experience and I got to learn so many new things from them. Their views towards children and women were different and strange. They knew about the problems faced by women and children every day but were not ready to talk about them. They just accepted what the government did and therefore, did not question the authorities. Many projects run by the government did not even reach them. But many were not aware of their rights and responsibilities too. However, some people in villages were actively participating in the programmes and they really wanted to change their society, especially the children. They talked openly about some issues faced by them during video van runs. They were very happy that we visited them. Working with the video van was the best experience of this internship. Traveling around 80 to 90 Km daily was a very tiring job but when we saw the faces of people after the event it made me feel delighted. I was supposed to take feedbacks from 10 different people on each spot. The people were very happy with us and our work. I never thought an internship could be this exciting. An internship is the integral part of the Law where you apply your theoretical knowledge practically. Although there was no work related to law in Breakthrough, you will get to know how an NGO works. In the first year a law student does not have much knowledge of the law, so he/she must get the experience of working with an NGO.